If you’re a blogger, you sometimes feel like you’re out of ideas. Everything you write feels rehashed and stale. It happens–we’ve all been there. In this post, I’ll show you how to find out what people are interested in right this minute and use it to put a fresh spin on your blogging. Google Trends, a keyword search tool the search company recently revamped, is a great tool to find out what’s trending. You may already use Google’s Keyword Tool to compare and and finding keywords and their search volumes, but that data doesn’t change much month-to-month. On the other hand, Google Trends can help surface new ideas and topics every month and give you a understanding of what people are interested in at this moment. Let’s start with ‘Rising terms.’ These are keywords seeing a recent surge in search traffic. Check this chart at the beginning of each month to ensure your blog’s editorial calendar includes the newest, hottest topics in your niche. For this example, we’ll be researching “pumpkin recipes” from the perspective of a food blogger. First, add your target keyword to the “Search terms” box in the left sidebar. 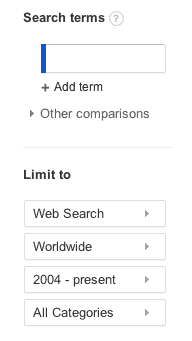 You can limit your search by geography, time, or category if any of those are important. The first chart that you’ll see tracks the popularity of your search term over time. 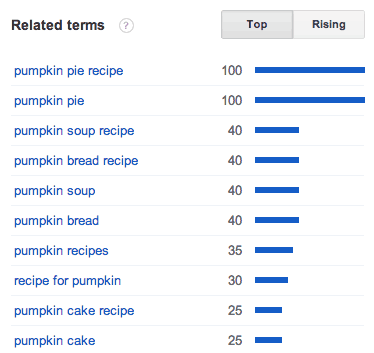 Predictably, interest in pumpkin recipes spikes every October and November. We’re on the right track. If you find a search term that’s more popular at other times of the year, just add a note to your editorial calendar to blog about that topic then. Remember, demand for your topic already exists–you just need to create content to meet the demand. Below the ‘Interest over time’ graph, you’ll see two more boxes. The second box, ‘Related terms,’ is the more important one. Click the ‘Rising’ box to show which searches are growing in popularity. This short list is a goldmine of data. Notice that the keywords are different from the ‘Top’ keywords? 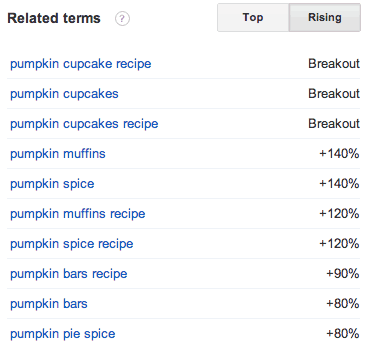 We’ve found four new, trending topics: cupcakes, muffins, spice, and bars. Now our food blogger can give her readers what they’re interested in right now: pumpkin cupcake recipes. Using ‘Rising terms’ is a great way to find new angles of your topic that you know people are searching for. Your competitors won’t be as on top of these breakout keywords, so they can help you stand out from the pack and differentiate your site. Plus, you’ll have a great opportunity to rank well in Google for these keywords and generate more SEO traffic. Besides finding hot topics within your niche, you can also put a new spin on an older topic. A new post doesn’t have to be 100% original–a change in perspective will help the post resonate with new readers and can rejuvenate your writing. The technique below is a great way to generate new ideas when you’re feeling tapped out. Here, Google aggregates the most popular stories, regardless of topic. You’ll typically see lots of news, celebrity, and entertainment stories. 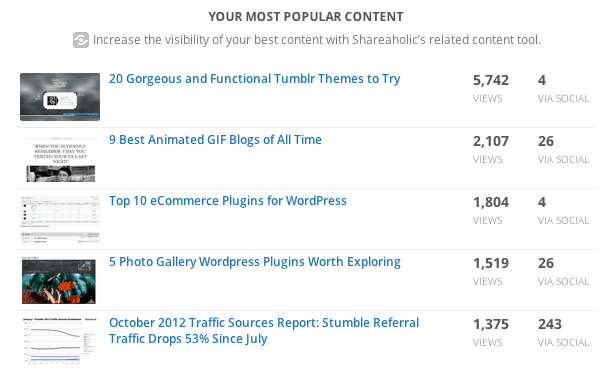 These topics aren’t always directly related to what you blog about, but they are top of mind for the general public. The challenge is to relate these topics back to your niche. You can find the ‘Hot searches’ section at the top of the left sidebar. While exploring Google Trends, I found Hostess to be trending. The ‘Hot searches’ section is a great way to look at your niche from a fresh and current angle. Copyblogger is great at writing headlines and framing posts this way. For an example, read 20 Content Marketing Lessons from the Immortal Jimi Hendrix. Now you can find newly popular topics within your niche and hot news stories to inspire new takes on your topic. Do a few test searches for your target keywords. What did you find? What will you write about today? Fred Perrotta is the co-founder of Tortuga Backpacks and a freelance startup marketer. Featured photo courtesy of m4tik.